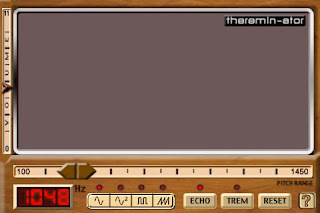 Yesterday I mentioned that Thereminator had been updated to version 1,1 with both some improvements and enhancements. Well, I tried out the new version on the train this morning on my way to work. I have to say that it is a big improvement on version 1.0. The sound is much smoother and the enhancements, like reverb and increased delay length have made this more fun to play with.